In Estonia we have a tradition to have buns with whipped cream on Shrove Tuesday. This year I came up with gluten free yeast free buns recipe because I can’t use yeast as leavening agent. 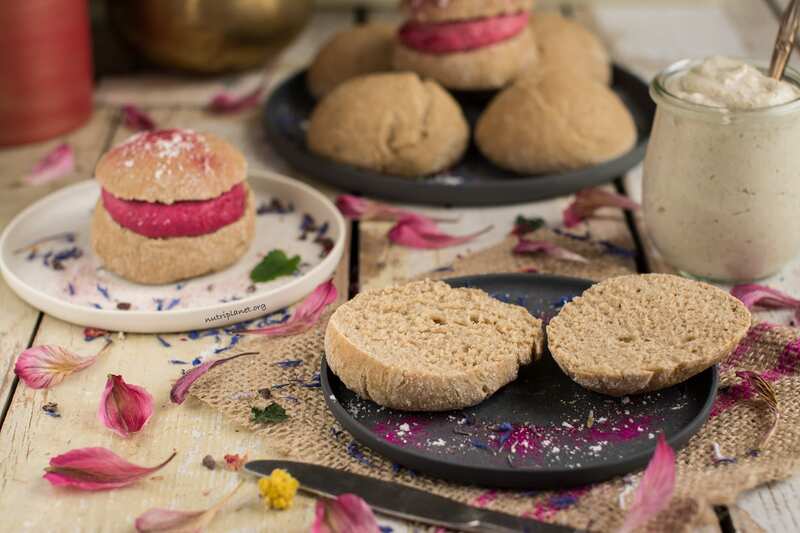 Should you prefer traditional buns, go check out my spelt buns with yeast. Also, go read about Shrove Tuesday, Mardi Gras, Pancake Day from the same post. So, moving on to the recipe, I took my vegan gluten free cinnamon rolls as a base and modified the dough a bit. I basically used less flour to make my gluten free yeast free buns softer. After all, there’s no rolling involved, so less flour doesn’t create any problems. The gluten free flours I use are brown rice, raw buckwheat and oat. Leavening agents are baking soda and baking powder. And finally, psyllium husk powder acts as binder to hold the dough together. This bun recipe is not only for those intolerant to yeast and/or gluten, but also for all of you lazy cooks out there! Don’t worry, I’m actually one of you 🙂 It’s nice to be able to bake those buns quickly instead of waiting for the dough to rise. Do you agree? …or with my buckwheat and cashew cream. I find this recipe so versatile because you can also use it to make gluten free bread or sandwich and hamburger buns. Have them for breakfast, with your main meal or as snack and they even are suited for dessert when served with my vegan ricotta cream cheese or caramel sauce or healthy chocolate sauce. It’s a real feast either way! 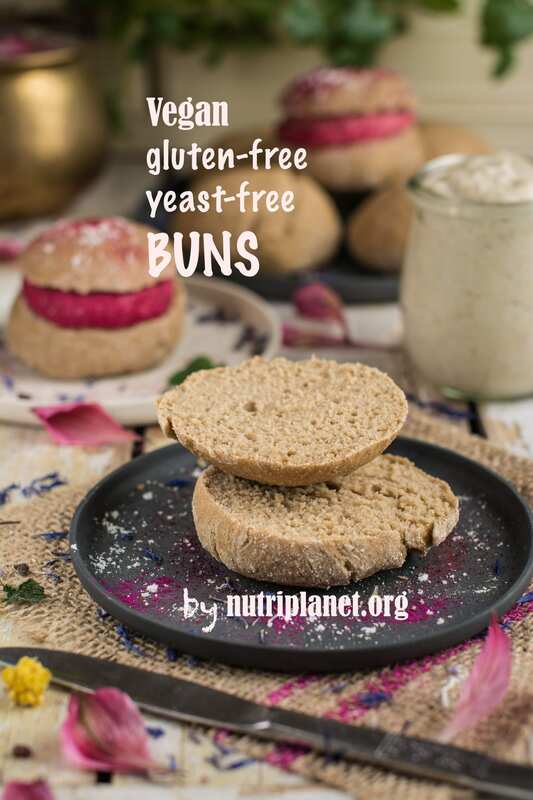 I’d love to know if you’re making those gluten free yeast free buns! Leave me a comment below or tag me if you share your buns somewhere in social media! Then, measure rice, buckwheat and 1½ cups of oat flour and out in a bigger bowl. Also, add the remaining dry ingredients to the flour (except the flour to be added later) and mix well. By now, your soymilk looks like buttermilk. Add soy yogurt and stevia to it and stir. I used about 35 drops of liquid stevia. Next, prepare a surface for kneading in the rent of the flour or use a silicone rolling mat. Add the reminder of flour in the middle of the mat and spread it out a bit. Form a tube and cut the dough into 8-10 pieces. 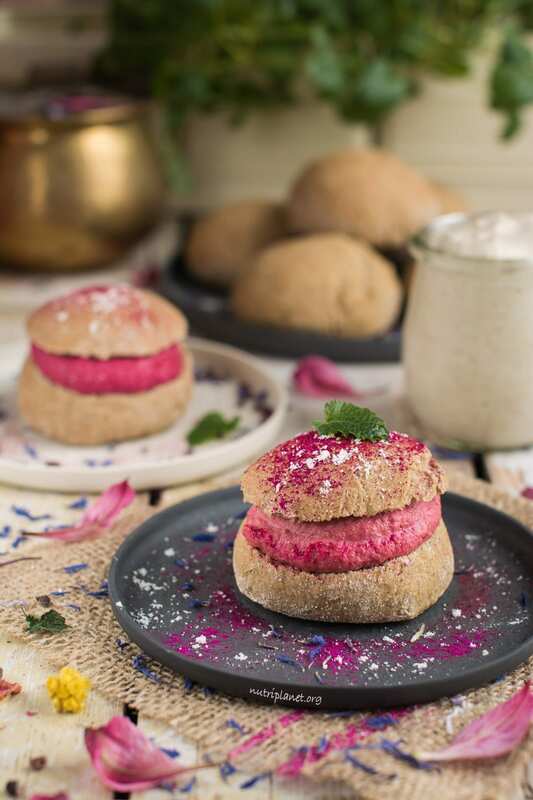 Pat them between your palms to make nice buns (you may need some extra flour to prevent the dough sticking to your hands) and place on a baking sheet lined with parchment paper. Brush the buns with some soymilk to lose the floury tops. Finally, bake the rolls at 200°C (390°F) for 20-22 minutes until golden brown. Nutritional info per bun (1/10): 131 kcal, 22.8g carbohydrates (69.7% of kcal), 2.49g fats (17.1% of kcal), 5.61g protein (17.2% of kcal), 3.86g fibre, and 13.6 GL points. If you’re not on candida diet, use any sweetener you like, e.g. coconut sugar, agave syrup, maple syrup. 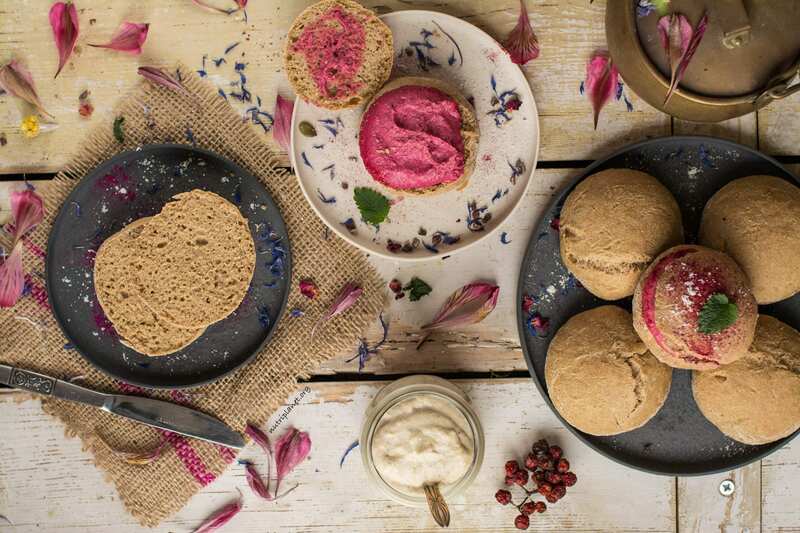 Alternatively, ditch the sweetener and make savoury buns. Instead of apple cider vinegar, you can use lemon juice. Try opting for aluminium free baking powder. Grind your own gluten free oat flour using gluten free oats. Store the buns in freezer and heat up in (microwave) oven whenever needed. As far as the rising is concerned, they don’t rise as much as buns with yeast would, but just enough for the result you see on my photos. When you leave them uncovered after baking, they will turn hard on the outside. I usually let them cool down and then either put them into freezer or into a container with lid (not closing too tightly) so that the moisture wouldn’t escape. Hi. This sounds amazing! Do you think I could sub oat flour, I’m allergic to oat, and I would love to make buns! Thank you! 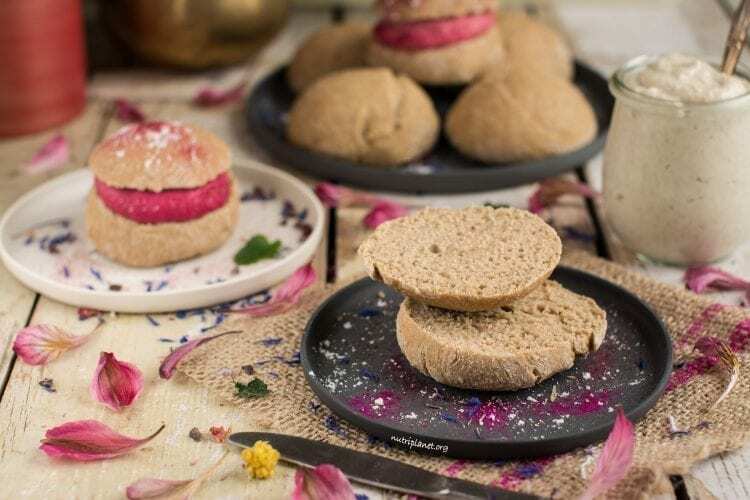 You can try subbing it with buckwheat and rice flour or a ready-made gluten-free flour mix or even corn flour. If you go for buckwheat or rice or millet flour, you’d most probably need to add a bit more liquid or use less flour as these flours are heavier and absorb more. I am allergic to soy products. Can another plant based milk and yogurt be used? Yes, of course! Any plant-based yogurt would work! Do you have a recommendation for a flour besides buckwheat? Thank you. Hi! You can sub it with oat flour or teff flour. If you don’t have issues with gluten, then also spelt flour would be suitable. Happy baking!